Massachusetts is home to a lot of history. Because it played an important role in the American Revolution, it is full of history based on the Revolutionary War and much more. In addition, its relative location to the harbors made it a landing place for many ships. Here's some information on the history. John Cabot, also known as Giovanni Caboto was a famous English merchant who sailed to America in search of money and gold. He landed in Massachusetts. Miguel Corte-Real sailed four years after Cabot and is claimed to have been the first person to spot Native x in Massachusetts. Then, the Pilgrims arrived on their worn out ship, the Mayflower, and barely survived the winder of 1620 since they were hardly able to get settled in. The Puritans arrived nine years later and started the Massachusetts Bay Colony. They called this colony the "City Upon a Hill" because they wanted it to be a model for how other colonies should be built. 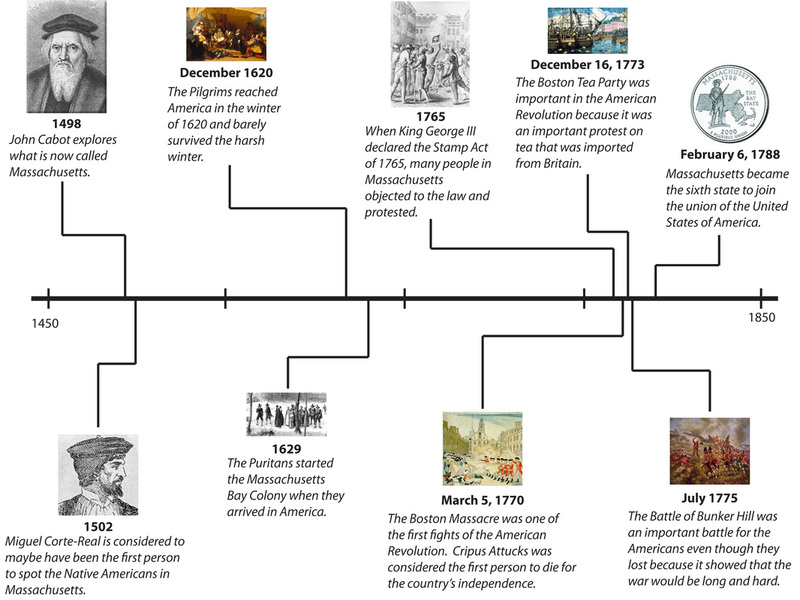 After this, the more colonies began to be settled, and then the American Revolution started. A series of events took place back to back over these years. First, King George III approved the Stamp Act of 1765 and started collecting the new taxes. Many people around the colonies protested. Five years later The Boston Massacre occurred when a redcoat was being taunted and having snow balls and rocks thrown at him. The redcoat told his fellow soldiers, and they came to support him. They were ordered to load their guns but not fire. However, they were so overwhelmed that they fired into the crowd anyways. Crippus Attucks was considered the first person to die for the country's independence. Shortly after this event, the Boston Tea Party occurred on December 16, 1773. This was very important because it showed Britain that Americans weren't going to let them control them anymore. During this event, Patriots dressed as Mohawk Indians broke into 342 chests of tea and dumped them into the harbor. They sang, "Rally Mohawks bring out your axes.! Tell King George we'll pay no taxes!" Finally, in July 1775, the Battle of Bunker Hill was fought and showed England that the war to control the colonies would be long and hard. Even though the Americans lost, they defeated about half of the redcoats who were marching up the hill. King George even had to send more soldiers to reenforce the soldiers already there. The only reason why the British won was because the Americans ran out of ammunition to shoot. Massachusetts finally, became a state on February 6, 1788, after the Americans and British had signed the Treaty of Paris, which ended the war between the countries and gave the Americans control of the colonies.